We encourage visitors to come and experience what God is doing at our school. If you are in the area stop by and join us for a day or two. You can audit up to four days in First Year and four days in Second Year. First and Second Year are open to visitors on most days (see Calendar for dates closed to visitors). First Year visitor registration opens at 11:30am and is located on the first floor lobby of the Redding Civic Auditorium. Second Year visitor registration is open from 12:00-1:00 in the Hebrews Lobby. Registration closes once capacity is reached as we have limited space for visitors. Occasionally we allow the opportunity for visitors to attend special sessions with guest speakers. Those working the Visitor Registration tables will let you know if auditing is available for that particular session. There is a $10 audit fee for special sessions and payment is by cash or check only (checks made out to “Bethel Church”). An ATM is available for your convenience. We videotape many BSSM sessions and by entering the building, you are giving permission for us to produce and distribute (without financial remuneration) any footage or photographs which may include your appearance and/or voice. Visitors can park in any open spot in the main lot of the Civic Auditorium. 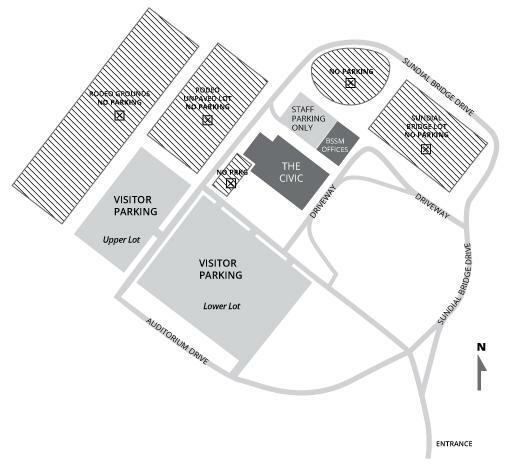 Please do not park in any gravel lots or at the Sundial Bridge/Turtle Bay parking area while visiting BSSM. Visitors must wear a name tag for security purposes. These are given at the Visitor’s Table after registering. Visitors may attend class for a maximum of 4 days per school year. Visitors must sit in the specifically designated Visitor’s Section after they have registered. Visitors can only attend our general sessions. Small group, Revival Group and off campus activities are not open for guests due to room constraints and to protect student confidentiality. A $10 audit fee is required when there are guest speakers and on conference days. Children under 12 are not allowed.